This year Frankfurt Light+Building celebrated its 12th year since its inception in April 2000. The light+Building exhibition is "the worlds biggest trade fair for lighting and intelligent buildings". Intralux remains the only Australian lighting product developer to continuously participate in this industry leading global event. Along with the increase in exhibitors, visitor numbers surpassed the previous record of over 196,000 trade visitors over the 6 day exhibition held in the heart of Frankfurt, Germany. The exhibition prides itself on a predominately 50/50 attendance of German visitors versus international visitors from outside of Germany. 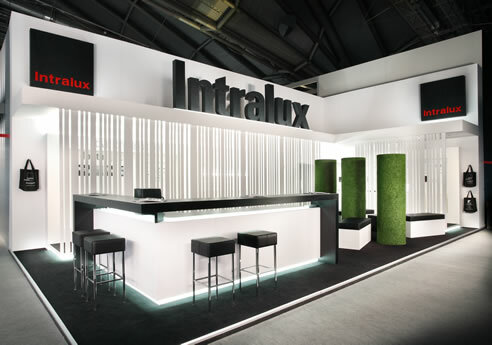 Intralux exhibited alongside the likes of iGuizzini, Norka, Osram, Delta Light, Insta and Zumtobel as well as thousands of others which totalled some 2, 352 exhibitors from over 50 countries. Light+Building 2012 signified the global release of several new products to join the Intralux family of lighting solutions. The star attraction of the Intralux exhibition stand this year was the Kove Professional indirect lighting system. 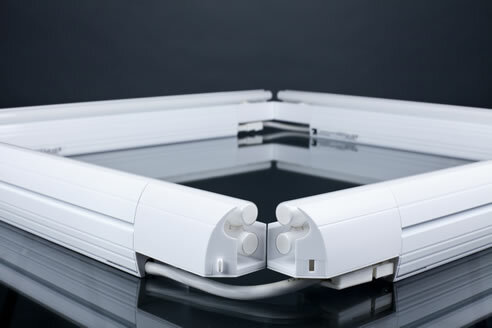 Kove Professional is the ultimate modular pelmet lighting system. Its award winning designed fixtures utilize the new generation Osram Seamless T5 lamp technology. As a high performance indirect system, the need for maximum performance and efficiency are delivered by default. The typical Kove product benefits of, well documented specification data, rapid installation via 'plug+go' and low cost maintenance make this the only choice for the professional lighting practitioner with availability throughout the world. The product group carries both European and North American certification. Fascinating that in an era of exponential LED product growth, the Kove Professional leads the performance and economy stakes utilizing what one could describe as a traditional high performance lamp source. 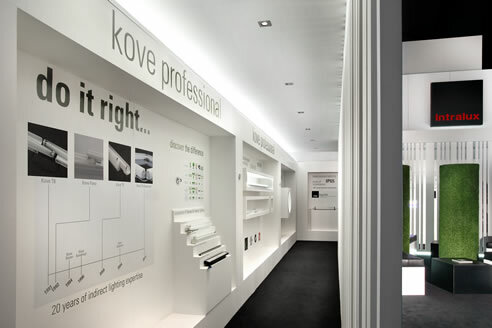 Coupled to photometry and modelling possibilities, the use of Kove Professional as a functional task lighting solution within an environment has never been easier to justify. Whether a shopping mall or commercial interior, gone are the days of pelmet lighting being purely a decorative feature. A reduction in capital expense in other direct lighting hardware on the ceiling line, means Kove Professional can not only illuminate the environment from a user-needs perspective, but also assist the building designer in minimizing the visual clutter on the clean ceiling lines of today's great buildings. Kove Professional is a well justified and very cost effective solution. Enepro, the new generation LED downlight for interior applications, designed as a direct replacement for the traditional MR16 / 50w halogen lamp fixture. The Enepro offers not only a high luminous output and unbelievably smooth light distribution, but also offers a cost effective, energy efficient light solution for your next project. Astounding lamp performance of 1085 LED lamp lumens coupled to a 68% energy saving in comparison with the traditional 50w MR16 lamp due to the Enepro's low power consumption at just 16w, thus making Enepro the perfect downlight choice. Available in many beams, colour and low glare configurations. Xenflex LED Strip lighting is a new sustainable lighting system for the future. Incorporating outstanding energy efficiency and low maintenance benefits via cutting-edge Solid State Lighting (SSL) technology. This revolutionary LED strip lighting system offers individual led lamp replaceability should a lamp fail .The sophisticated lamps have onboard technology to ensure that they all illuminate to the same level which enables run lengths up to 10m on one 24VDC power supply. The exhibition brought many success stories, re-ignited prior business relationships from around the world, and offered relaxed opportunities to catch-up with key lighting designers, architects and consultants to share with them the newest innovations from Intralux. The general consensus from visitors to our exhibition stand was extremely positive. "It was good to have refresher and an update for the Kove and Cog T5 both of which I have used. At first impression the stand looks subdued but then this is a good thing as it was an opportunity to get away from the glare of competitor stands trying to outdo each other. A relaxed ambience to unwind. I also thought the 'Tunnel of Love' is quite successful in that it is more intimate and allows better focus of products on display and concentration on what the presenter has to say as opposed being distracted by bombardment of light sources and surrounding noise/chatter. " 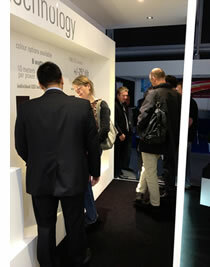 Visiting Intralux Australia at the 2012 Frankfurt Light + Building Fair was an intimate experience in lighting. The virtual one-on-one engagement provided a detailed insight in to the simplicity and rigor of their boutique range of available fittings and their supporting technologies. Revealed was their well considered and researched methods in developing new LED lighting, as well as incorporating LED into appropriately selected current fittings. It was clearly evident that both practicality and functionality under pin and drive the performance outcomes of all their lighting." "The well organised walk through the stand was very informative and the technical ability of the lady who took us around the stand was unquestionable. Good to see your products have kept developing and that Intralux is constantly striving to make improvements to its products. In addition I was interested to learn that Intralux is investigating the possibility of using LED in its pelmet lighting systems." The next light+building will be held in Frankfurt am Main from 30 March to 4 April. I would like to enquire about Intralux Australia Pty Limited.